The great tradition of Lawrence High School football met a sort of drought following their 1995 6A State Championship. For six long years LHS had no player named 6A All-State. That was until Brandon McAnderson came to LHS. 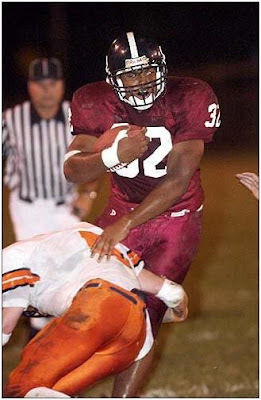 McAnderson began his varsity career as a sophomore for Lawrence in 2000. Getting carries as a running back McAnderson helped Lawrence to a 6-4 record and a playoff berth. The following season, in 2001, McAnderson took the load as the team’s work horse. He led Lawrence to a 5-4 record, starting at both running back and linebacker. Although his team didn’t make the playoffs, McAnderson was still awarded first-team All-Sunflower Conference honors on both sides of the ball. The honors were nice, but McAnderson’s true goal was to get Lawrence High back on track. The 2002 season for Lawrence turned out to be one of its best in years. McAnderson led a strong group of upperclassman, as the team advanced to the Sectional Round of the state playoffs. 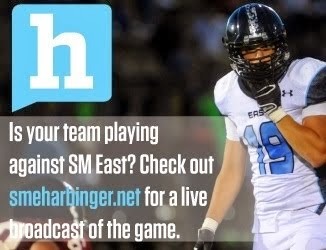 Sitting at 8-2, Lawrence faced a 7-3 Olathe East team they had defeated 26-7 earlier that season. McAnderson stepped up in the game, and led Lawrence admirably with two touchdown runs, but in the end a few botched extra points ruined Lawrence, as they lost 21-19. McAnderson and his fellow seniors ended their season 8-3, but they had put the Lawrence High program back on the right track. McAnderson ran the ball 236 times for 1,789 yards and 25 touchdowns as a senior. For his career, McAnderson rushed for 3,059 yards and 41 touchdowns. On the defensive side of the ball McAnderson totaled 132 tackles as a senior, and led Lawrence as a team for the second straight year in that category. McAnderson was once again named First-Team All-Sunflower Conference at linebacker and running back, in addition to being named All-State Class 6A, and being named Kansas Top 11. McAnderson accepted a scholarship to play at Kansas University, where he enjoyed a very successful career. In his senior season at KU in 2007, he started at running back and led the Jayhawks to an Orange Bowl victory over Virginia Tech. **Olathe North's Lucas Vincent was chosen to play in the Offense-Defense All-American Bowl in Myrtle Beach, S.C. on January 2nd. Is that Anthony overated parks missing that tackle?